Sproutbrite means “to grow brighter everyday.” We’re just like seeds, we start small & work towards making things bigger & stronger. If you’ve ever considered starting a garden but thought, “it’s too hard,” or live in an apartment and thought, “I don’t have a yard,” now its easier than ever! Discover the fun of growing from seed. We’ve taken the guess work out. Everything you’ll need in one place. A perfect gardening gifts for men, women, and children. Take a break from the pace of the modern digital world! Grow your own fresh herbs! They are better than the ones sold in grocery stores! Herb plants enhance your kitchen, windowsill, office, or bedroom & taste great for home cooking. Nurturing herb plants is a a good activity for people of all ages! With better growing instructions & superior starting materials, we'll give you the best chance of having herbs grow. Includes expanding Coco Coir Soil, a superior growing medium that provides better drainage and water retention in case you miss an occasional day of watering. Functional accessories like pot bases to keep your growing area clean, plant markers to organize pots, & a mini shovel for transplanting. EASY STEP BY STEP way to grow herb plants from seed, backed by a 100% guarantee. Thorough instructions specifically made with beginners in mind. 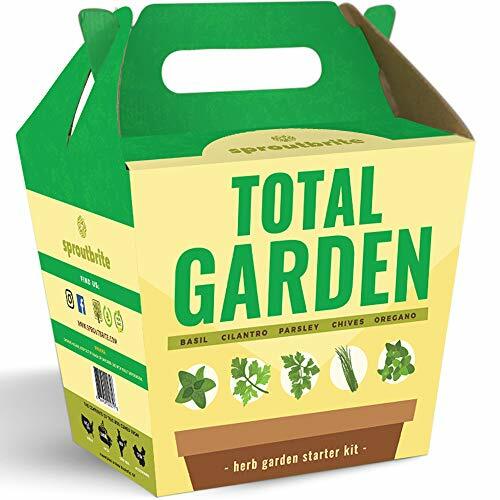 LARGEST STARTER POTS - 4 1/2" - Can grow one full sized herb plant without transporting into a bigger pot or transport into a bigger pot for multiple plants, EXTRA SEEDS - If you don't get it right the first time, this kit includes enough seeds to try again & even again. BOLD & UNIQUE PACKAGING - Not your average plain square box! Make an impression. Feel proud to give a gift that looks great but more importantly will work well for the recipient! This DIY herb starter kit is a unique gardening gift for women, men, gardeners, or a fun hobby for kids that teaches patience. If you have any questions about this product by Sproutbrite, contact us by completing and submitting the form below. If you are looking for a specif part number, please include it with your message.